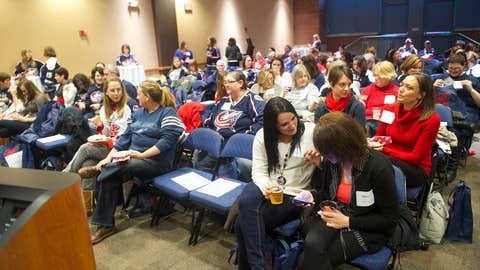 Over 100 women attended this year's Hockey 'n' Heels to hear from guests including Blue Jackets Assistant Coach Dan Hinote and Forward Nathan Horton. "Girls understand the game of hockey just as much as the guys." That’s what Columbus Blue Jackets forward Nathan Horton believes–and what the organization sought to support Saturday night at the third annual Hockey ‘n’ Heels. "With all the conversations and information, this is a lot better than being in an autograph line," said Blue Jacket season ticket holder Vanessa Garvin. "Hockey ‘n’ Heels" was held prior to the Dec. 15 game versus the St. Louis Blues. Over 100 women — and a handful of men — showed up to spend a few hours with guests who represented all facets of the game. "I really like hearing the perspective of the front office, players and officials," said Garvin. "I can collect info from Internet and other places, but hearing from the real source is a great experience." 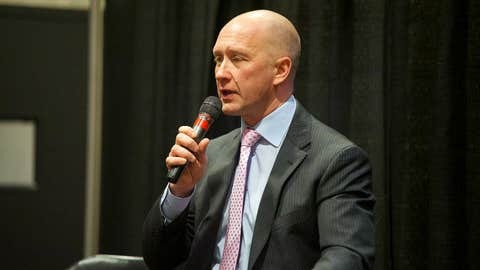 Columbus Blue Jackets General Manager Jarmo Kekalainen addresses the crowd at Hockey ‘n’ Heels. He answered questions on everything from conditioning to Olympic preparation. Jackets General Manager Jarmo Kekalainen was the event’s first guest speaker. He knows hockey is a sport both men and women support. "Getting more women engaged with hockey and helping them understand the whole picture helps the entire sport," Kekalainen said. Kekalainen has two daughters, and while they haven’t yet expressed interest in playing hockey they love to watch it. Kekalainen looks forward to encouraging them towards any sport that might interest them. That’s the same approach he brought to Saturday’s event. "(This event) is not just about getting people in the stands," Kekalainen said. "There are lots of ways for women to get engaged with hockey – it’s women who want to play, mothers whose children play hockey and women who follow the sport." In addition to hearing from Kekalainen, the event brought in former Jacket and current Team Ambassador Jody Shelley, Assistant Coach Dan Hinote, officials for the evening’s game and Jackets’ forward, Nathan Horton. The attendees included people of all hockey knowledge levels, including Kathy Carson from Newark, who was ready to see her first professional hockey game. "My friend said it would be a great time and I wanted to learn more about hockey," Carson said. Carson works with a number of hockey fans and she wanted to finally be able to join in the conversation about the sport. Saturday’s event gave her the opportunity to ask a question about the Jackets’ AHL team, the Springfield Falcons. "I think it’s great the Jackets hold this event specifically for women," Carson said. "It shows a lot of respect and consideration and I think it’s awesome." Veteran attendees agreed. Jessica Jones is a season ticket holder who came to love hockey when the Jackets were established in 2000. She was attending her second Hockey ‘n’ Heels event this year. "Every year we learn something new," Jones said. "Even though we’ve been coming to games for 10+ years, every Hockey ‘n’ Heels we learn something different." Jones is someone who not only enjoys the event, she’s been encouraging other women to come — some of whom now hold ticket packages for Jackets games. "I think it’s really important to get women in the stands," Jones said. "Hockey isn’t just a man’s sport. This helps break that stereotype." Questions throughout the evening ranged from hockey basics to more advanced topics including everything from who is the biggest prankster on the roster to how to practice, Jackets’ conditioning plans and the impact of the upcoming Olympics on NHL teams. Garvin, who also plays adult league hockey, was enthusiastic about the spotlight the event puts on the female fan community. "I’ve never thought the Jackets did not have a female fan base," Garvin said. "The Jackets know women are involved in the sport of hockey, otherwise there wouldn’t be so many here tonight." Attendees took home a goodie bag that included an event themed mug, a Meyers Jewelers gift certificate as well as a ticket to Saturday’s game. But the intangible takeaways were perhaps more significant. "Because this event is for women, it builds a really supportive environment," Garvin said. "People can ask all kinds of questions without judgment." See the Blue Jackets in action tonight against the Winnipeg Jets at 7 p.m. For more information or to buy tickets, visit bluejackets.nhl.com.